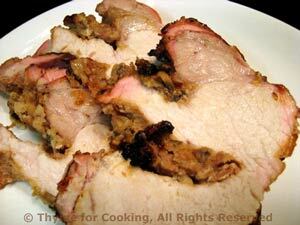 Stuffed and Barbecued Pork Loin, Thyme for Cooking easy gourmet dinners. 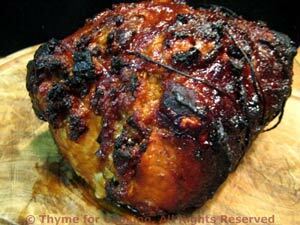 The Barbecued Pork makes enough for 2 meals. If you have any of the summer squash left, refrigerate and use it with the salad on Monday; just shred and toss with the lettuce. A Composed Salad is one that is arranged, artfully, on a plate rather than tossed. You can use any ingredients you like.... Have fun with it. Prepare lettuce; rinse well and spin dry. Peel and quarter egg when done. In a small bowl whisk mustard, lemon and vinegar. Slowly drizzle in olive oil, whisking constantly. 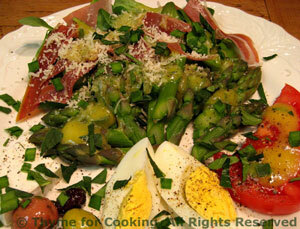 Artfully arrange asparagus, egg, tomato and Prosciutto. Sprinkle with cheese and herbs. Drizzle each salad with half the vinaigrette and serve. 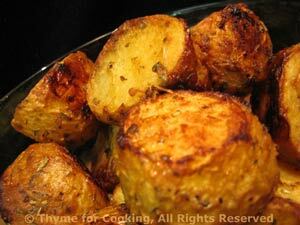 We grill potatoes a lot in summer; with a lot of variations.... This one is almost like a hot potato salad. Cut potatoes in half the long way and then in thirds the short way. Put mustard, olive oil, vinegar, garlic and herbes in a medium bowl, and whisk well; it will be very thick. Add potatoes and toss well to coat. Put them in an old 'for barbecue only' metal pan and cook over direct heat on the barbecue, stirring frequently until brown and done, 20 - 25 minutes. OR over indirect heat for 35 - 40 minutes, stirring occasionally. You can also put them in the oven on a baking sheet with lip (trusty round pizza pan) and bake at 400F (200C) for 30 minutes. Remove from pan and serve. These stay hot so a 10 minute delay is okay. 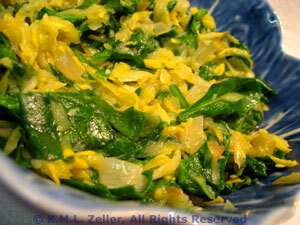 I used a yellow squash and, coupled with the bright green spinach, it made a very pretty side dish. Slice onion and mince garlic. Remove thick stems from spinach and cut into strips: put the spinach leaves together in one hand and snip with a scissors. Heat oil in medium, nonstick skillet over medium-high heat. Turn heat to medium, add squash and garlic, continue to sauté for about 15 minutes, stirring occasionally with a wooden spoon. Add spinach and chicken stock. Sauté just until spinach wilts.